Rob Zitz, senior vice president and chief strategy officer of the government systems group at Maxar Technologies‘ (NYSE: MAXR) SSL business, has received an award for his leadership role in Executive Mosaic‘s 4×24 program, designed for the government contracting industry’s most senior and most influential executives. 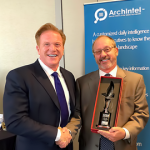 Jim Garrettson, CEO and founder of leading media and events hosting company Executive Mosaic, presented Zitz with his unprecedented sixth-time award for serving six times as the chairman of the company’s 4X24 program. Garrettson said that as a key leader and six-time chairman, Zitz drove the community with his experience and guidance, which are among the critical factors in the success of the program. He noted that leaders who serve as chairman ensure that the pier-based events serve first and foremost the needs of the peer group itself. Zitz stands above those who served as chairman and invested their time and energy into the program to support his peers and the mission, he added.